Denis Karp has been performing throughout the Baltimore/DC area for the past twenty years. A native of Baltimore, Denis began studying flute at the young age of six at the Peabody Preparatory. He has studied with Gail Cameron, Sara Nichols, and Doris Reinhardt. In 1989, he performed with the Baltimore Symphony Orchestra and James Galway on a two-week East Coast tour, playing John Corigliano's "Pied Piper Fantasy." In 1997, Denis was a finalist in The Judith Lapple National Flute Competition. In 2002, he received a Bachelor of Science Degree in Music from Towson University, where he performed as a soloist with the Towson University Orchestra. Denis also frequently performed throughout Maryland with the Towson University Early Music Ensemble under the direction of Dr. H. Gene Griswold. In 1997, Denis formed The Lenore Trio with his sister, pianist Larissa Karp Sanders, and his brother-in-law, bassoonist Eddie Sanders III. 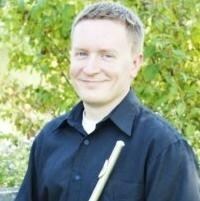 He is a member of The Gallery Winds, a woodwind quintet which also holds a summer camp for young musicians entering grades six through twelve. Denis has performed as a soloist at The Mid-Atlantic Flute Fair and has been featured on a United States Air Force Band Chamber Music Concert, playing recorder and flute. He frequently records newly published concert band music at Omega Recording Studios in Rockville, MD, as a member of The Washington Winds. Denis freelances with several local orchestras, concert bands and chamber ensembles, and performs in pit orchestras for musicals. Denis has taught private lessons since 1998. He has taught band in the Baltimore Lutheran School system and at the Beth Tfiloh Dahan Community School. He currently teaches private flute lessons at The Baltimore School for the Arts T.W.I.G.S. program (To Work In Gaining Skills), a community outreach program designed to provide Baltimore City's young artists an opportunity to develop and build upon their talents in the arts by training with professional artists. Denis also currently teaches private lessons throughout Maryland and Pennsylvania through a private studio. He frequently judges flute auditions for Maryland All-State Bands and has also been an adjudicator for Maryland State Solo and Ensemble Festival. Request Lessons with Denis today!